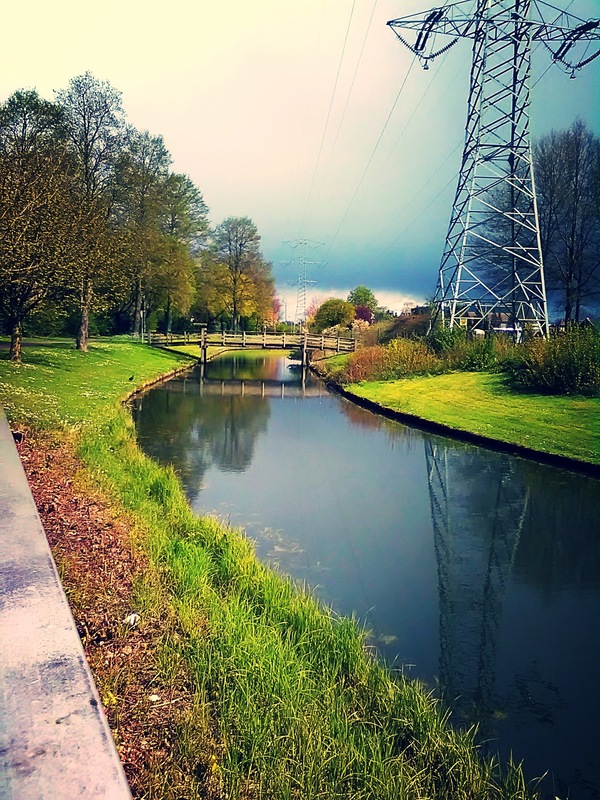 Spring in The Netherlands is a fickle and wet season. If you’re lucky though, there are peaks of sunshine to go out and get some fresh air and what better way to do so than by bike! 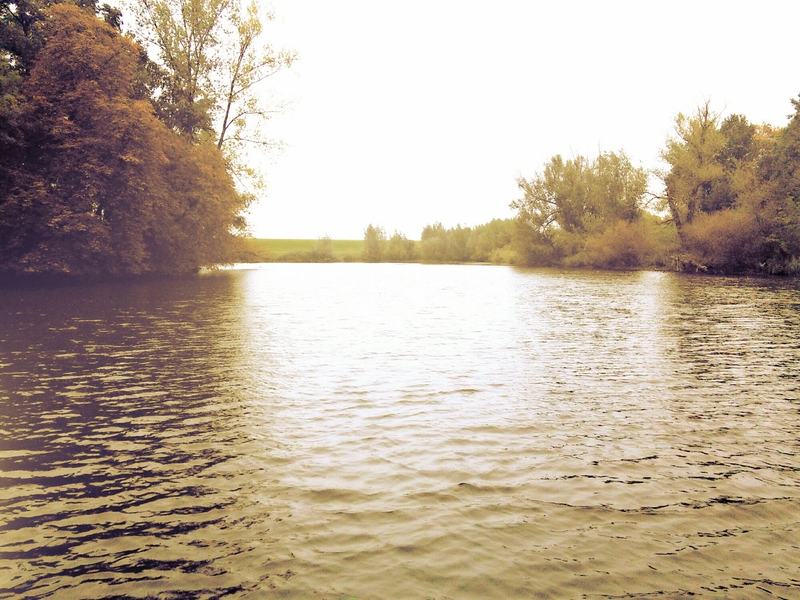 Having grown up in rural areas and usually always by water, living in the downtown of a busy city is quite a change. 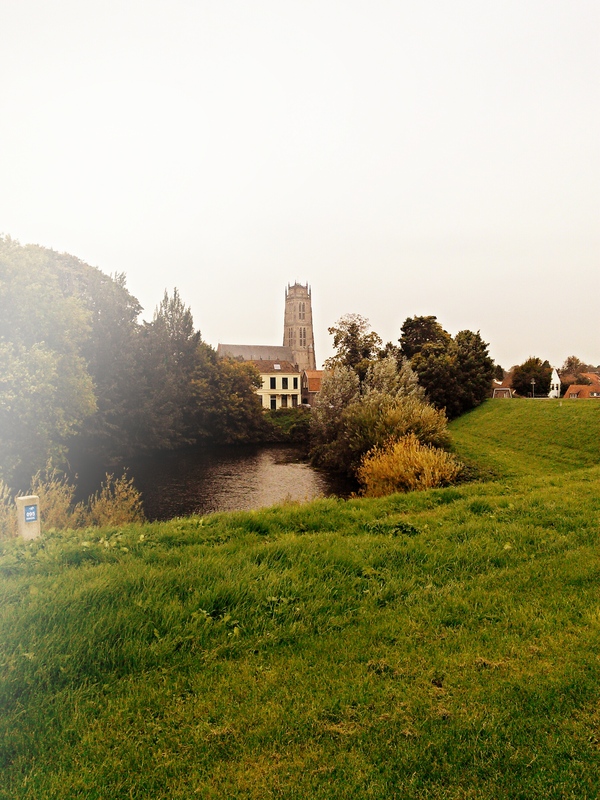 I love this country and it’s bustling streets, historic buildings, charming canals and bikes as far as the eye can see, but it’s always nice to find peaceful and secluded areas to touch back to familiarity. 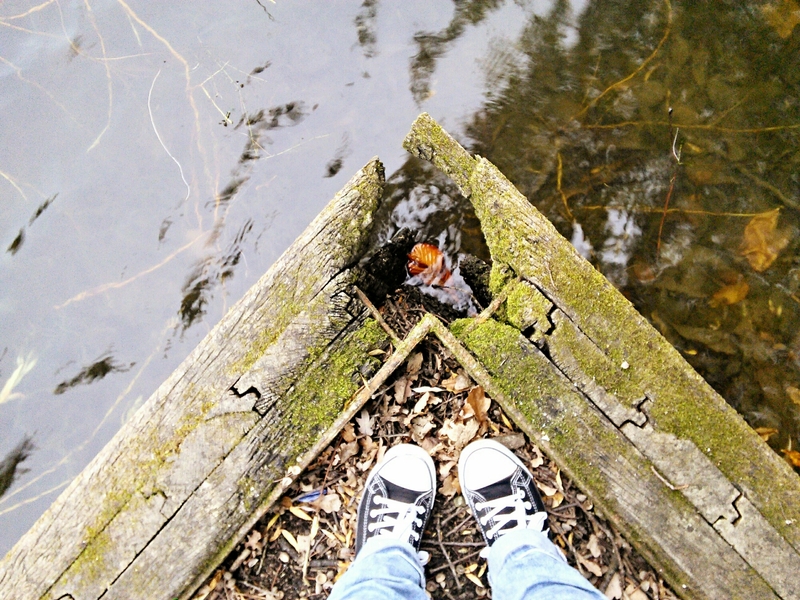 Places where you can center yourself and feel at ease. 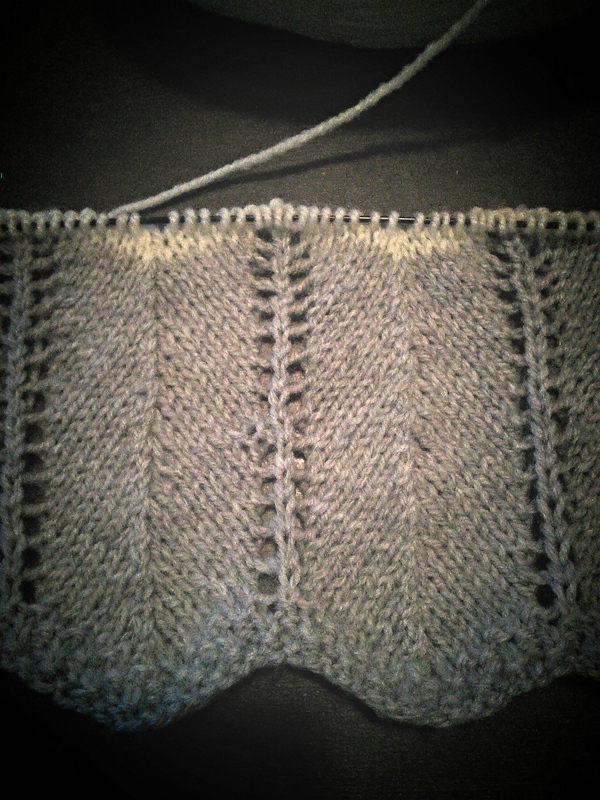 The “Lazy Hiker” shawl is well underway. 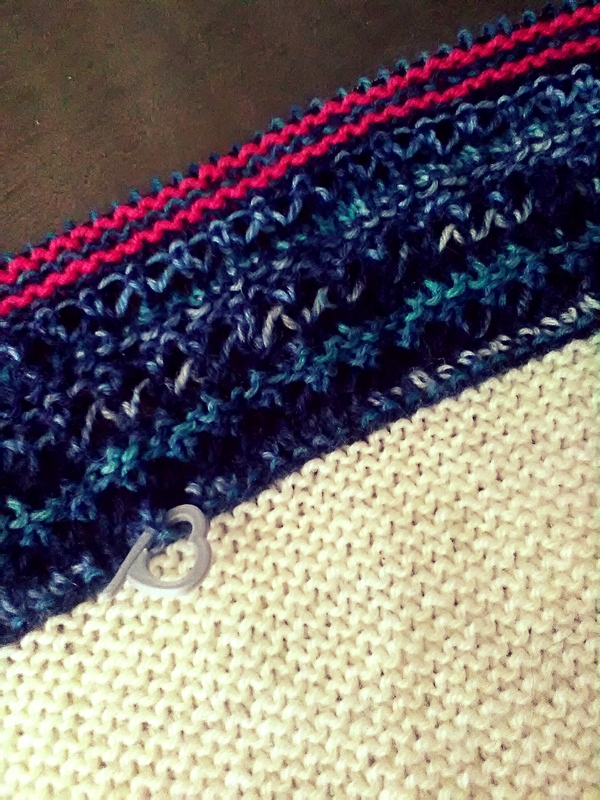 I was originally going carry on throughout the whole piece with cream and the denim blue variegated colors but I reached the roman striping and it just needed…a touch of excitement. So in goes some hot pink and it instantly comes to life! I’m really happy with how this piece is going and I’m excited for it to be finished so it can be worn. Also, startitus (a wave of uncontrollable desire to start a new project) washed over me and I have cast on and got through a cable repeat on a sweater for Alex. I realized a little too late I was reading the cable chart upside down so my cables will be in the incorrect order, but that adds charm! And personality! (I’m really just too lazy to tink back 8 rows to correct it). I think I’ll blame the sudden bout of startitus on Ravelry for having such a large collection of patterns instantly available. My library is well on its way to 500 different patterns…I think it’s safe to say that I won’t be running out of project ideas in my lifetime! I ventured out of my comfort zone this week and went to a local knitting café. My Dutch is not exactly the best but I get around and if all else fails me, most people here understand English very well. Sometimes, since a large part of the population here speaks English, I feel a bit hindered at learning the Dutch language. Most people hear my accent and immediately speak English with me. It’s a blessing and a curse depending on the day but I digress. 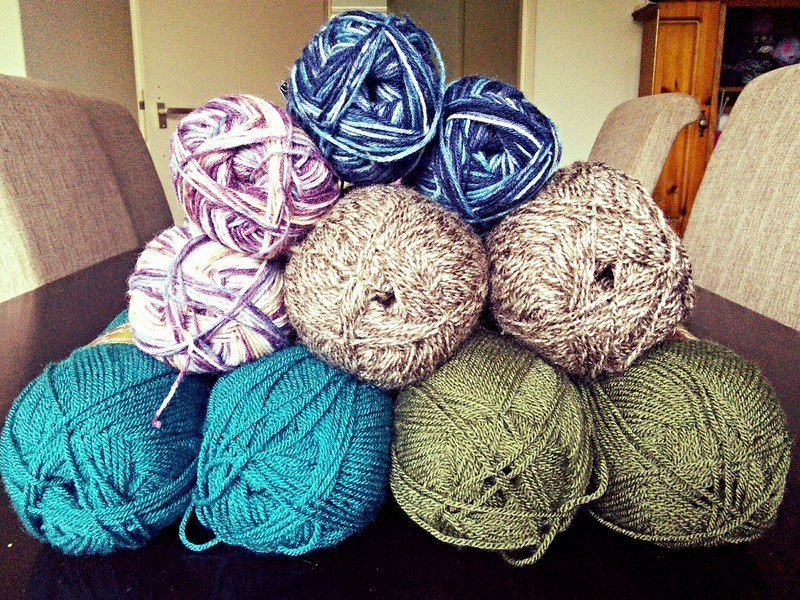 I was looking around online for a yarn shop to go and scope out and I happened across Breigaren-Den Bosch. It’s a cozy little yarn shop not far from my home (that could be dangerous…my stash always wants for more) and on Thursday evenings you can go there and drink coffee or tea and talk about what brings us all together, love for knitting and crochet. I met many friendly people there, got a little practice speaking Dutch, learned a few new tips on knitting and had an all around lovely time. It was a wonderful atmosphere (“Gezellig” as the Dutch say) and needless to say I’ll be going again fully armed to finally learn sock knitting (Thanks Ilse!). After an unexpected move to a new city and all of the challenges that came with it, I’m happy to say that I’m back and ready to get started again! Moving is always such a process. Packing, moving, unpacking, settling. Familiarizing yourself in new territory. 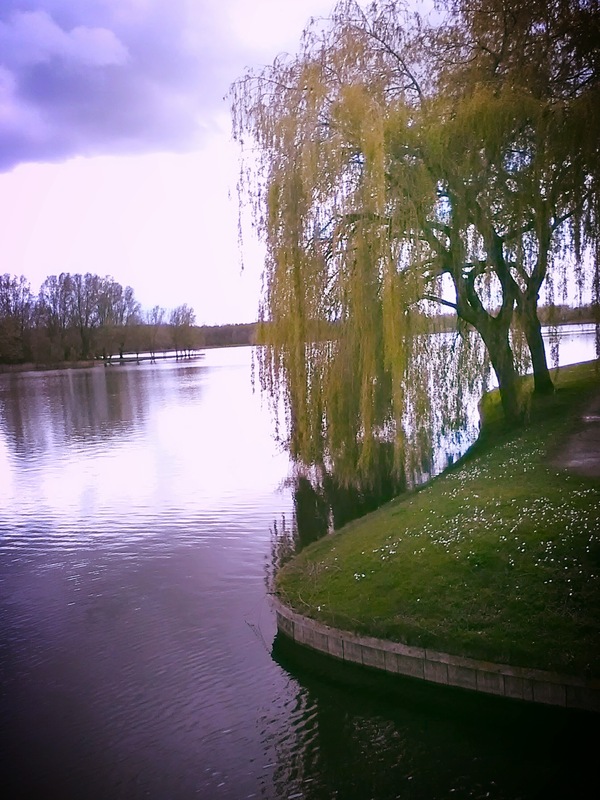 I’ll share some of the beautiful areas of ‘s-Hertogenbosch along with some of the things we’ve been up to the last months. -New additions to our family! We adopted these beautiful ladies in late December. They’re young sisters named Padmè (left) and Sabè (right). 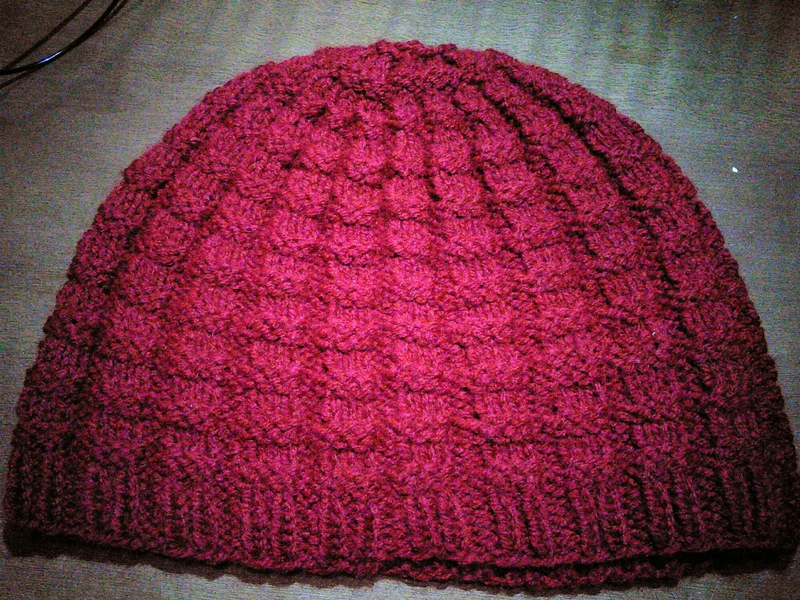 -Golf cap I crocheted for Alex. -Yet another Rip-Tide slouch hat in blue/green/cream colorways. One of my absolute favorite hat patterns! As first order of business, it’s time to sort and organize the mess that is my yarn cabinet. The dreaded process of going through projects that are cast on, figuring out what they were intended to be, ripping out projects that got lost along the way. The payoff being starting projects anew with recent inspiration. Spring has sprung and its time for color and light textured fabrics and I have a list a mile long (what else is new) of project ideas that I want to bring to life! -“Lazy Hiker” shawl I cast on before we moved. It’s going to get finished! 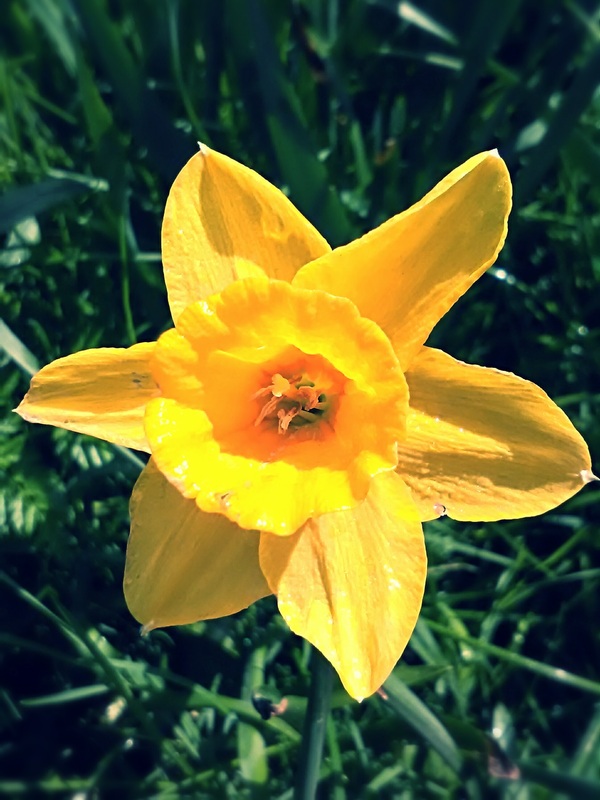 Will be perfect for spring weather! 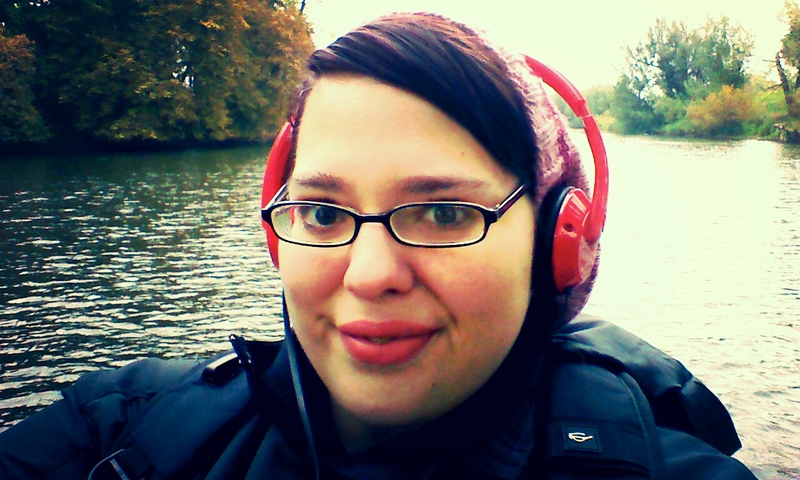 The blog has been given a facelift! Be sure to check out my Facebook page and Instagram. You can now get email notifications too so be sure to follow me and never miss out on a new post! 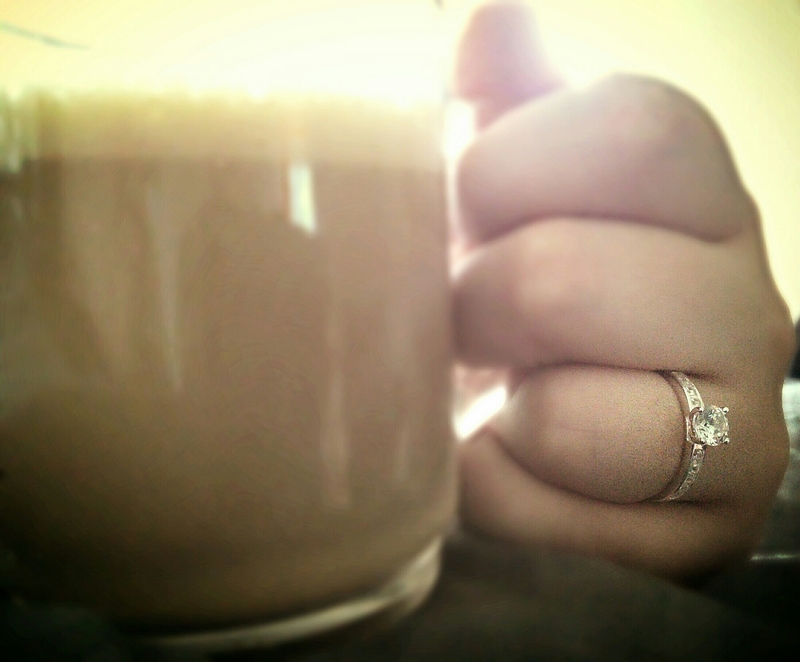 Now that I’ve given myself a direction, its time for coffee and knitting. Feels so good to be back. Thank you for stopping by lovelies! Hear more from me soon! I’ve had the light bulb moment. I’ve found the answer to the baby blanket conundrum. 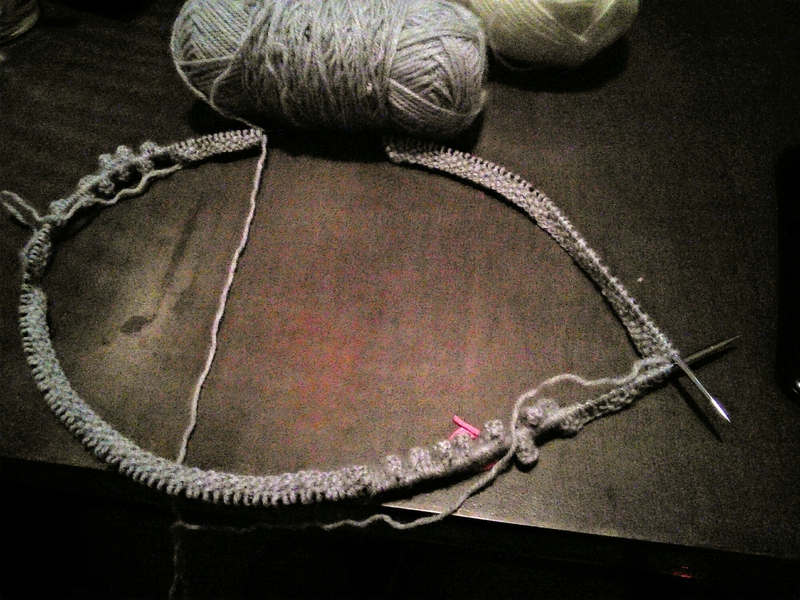 Double stranded knitting. Still get to use the same yarn, only on bigger needles and it goes multitudes faster and is twice as squishy. Sometimes you just have to keep trying everything until something works on projects. Finally, I’m getting somewhere! In preparation for future projects, I’ve gone to any knitters favorite place, the yarn shop. 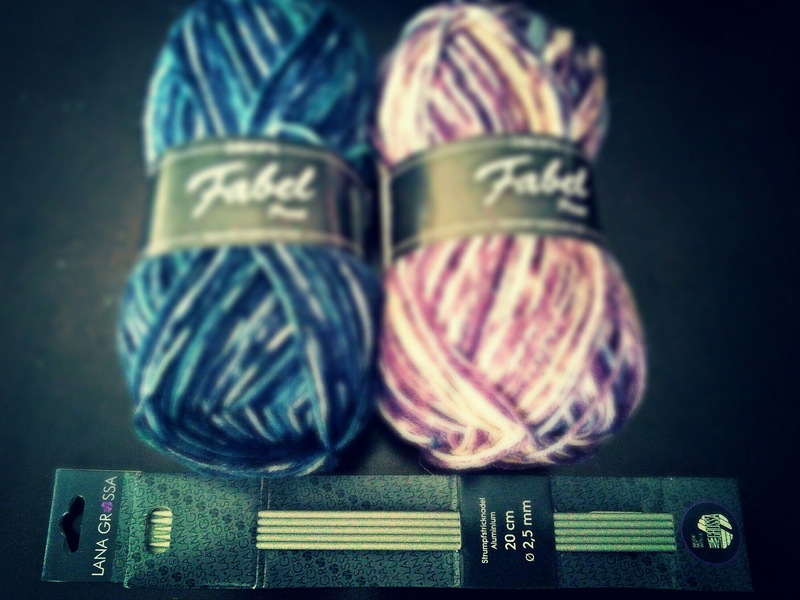 I have empty needles and it’s time to start some secret gift knitting along with some fun side projects. I broke down and bought DPNs to teach myself sock knitting. I’ve evaded them for months now, using the magic loop method on circulars for hats and mitts. Now is the time to learn a new technique and what better way to learn using DPNs than socks? 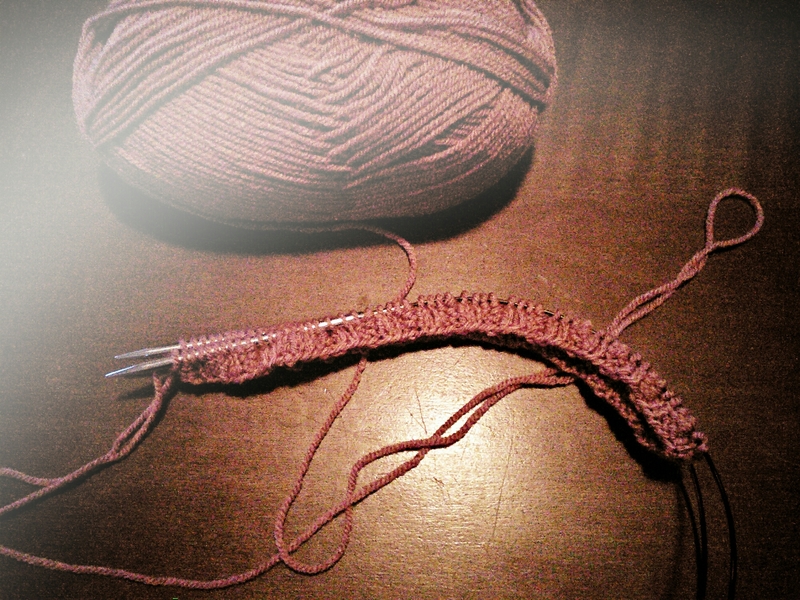 I’ve started my first sock adventure with worsted yarn and larger needles. I’ve ended up nearly impaling myself on multiple accounts and it feels at times like fighting an aluminum porcupine, but it’s not nearly as scary as I thought and what I’m wrestling is beginning to resemble a sock! It’s exciting and good fun. 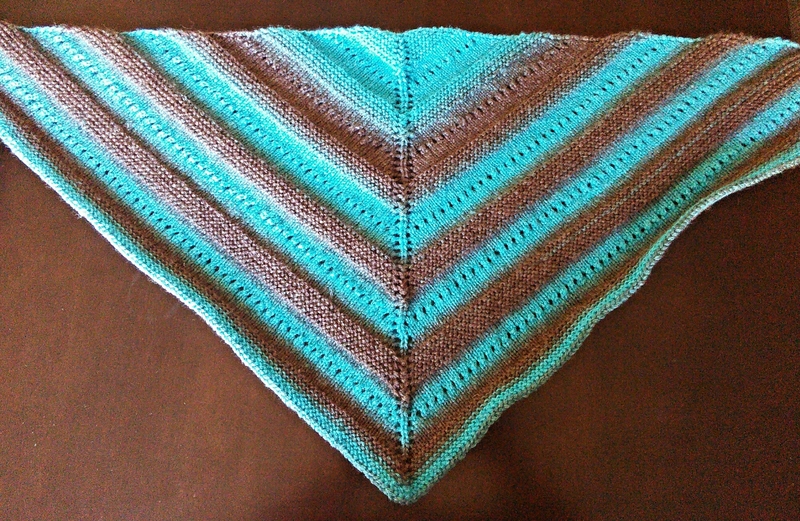 I’ve finished the shawl I was working on last week. It’s thick and squishy and warm, perfect for winter. I still need to block it, but here she is! 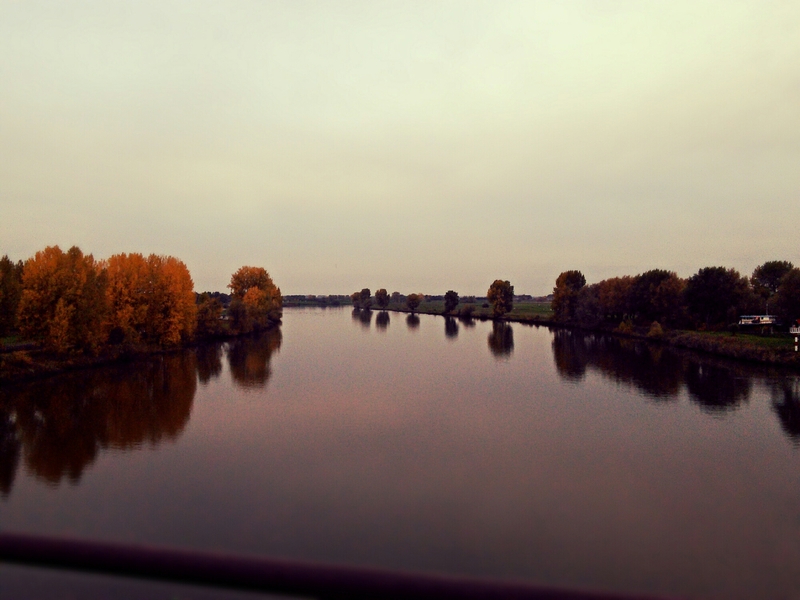 On a bike trip to the cinema over the weekend, Alex and I saw some beautiful fall colors. 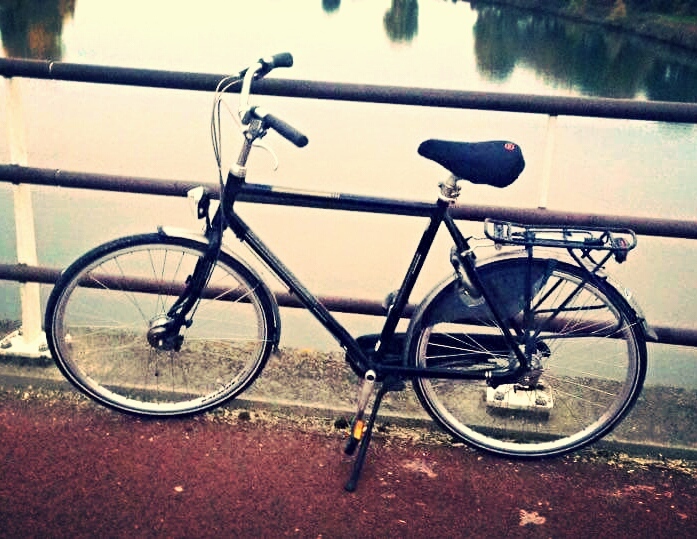 We cycled a total of 40 miles this weekend and I’m beat! Time to sit back, relax, sip some coffee and knit. Time is a funny thing. It goes sluggish when you want it to go fast and goes incredibly fast when you need it to go slow. The holidays are coming and for a crafter, Christmas is approaching at an alarming rate. How does a day that doesn’t move manage to sneak up on me every year? I’ll never figure that out. Life’s mysteries. File that away along with why I can never find a matching pair of socks and why all of my bobby pins disappear. 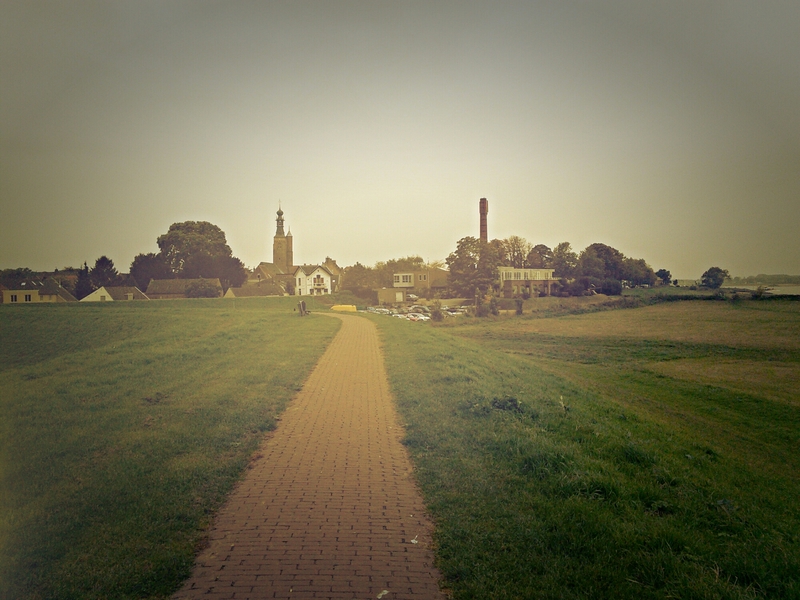 A few days ago I took a fall walk here in the nature of Zaltbommel. Despite being heavily overcast, it was beautiful. 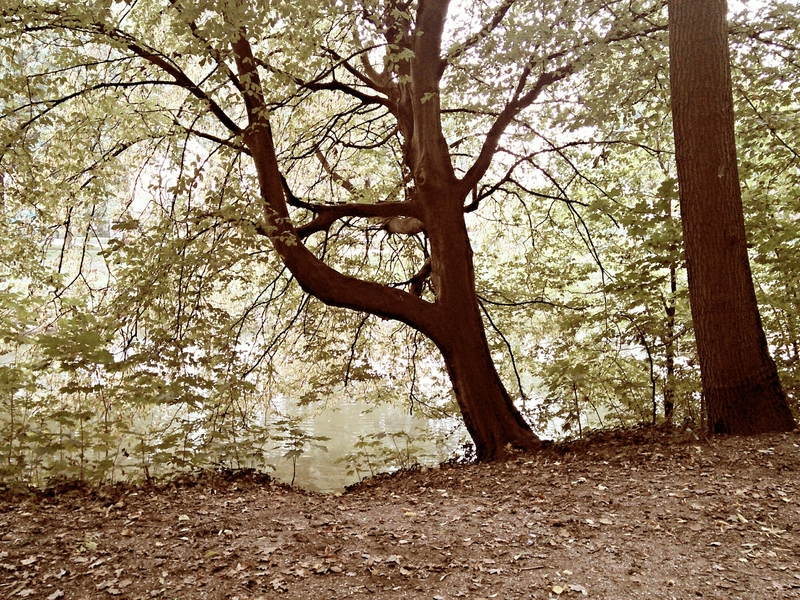 The leaves are just starting to turn making the woods look mysterious in the rain that is Autumn in The Netherlands. 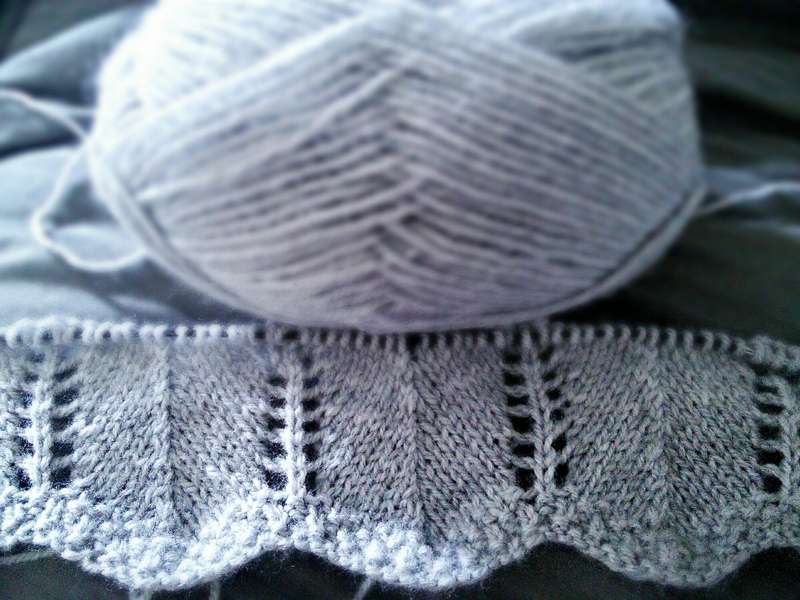 Of course I had to take a project with me which ended up being the shawl WIP in the baby stages. Over the next few weeks I’ll be doing a lot of secretive knitting. I just need to finish up what’s on my needles now and then start casting on gift projects. Tis the season! 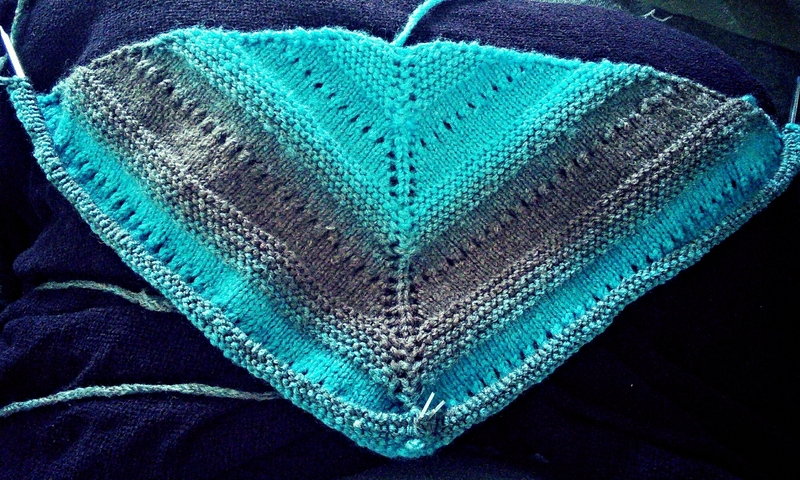 This is a shawl in progress. Look at the gradient! I am in love with it. It’s much larger now, although I won’t get another decent photo of it until it is off the needles and blocked. 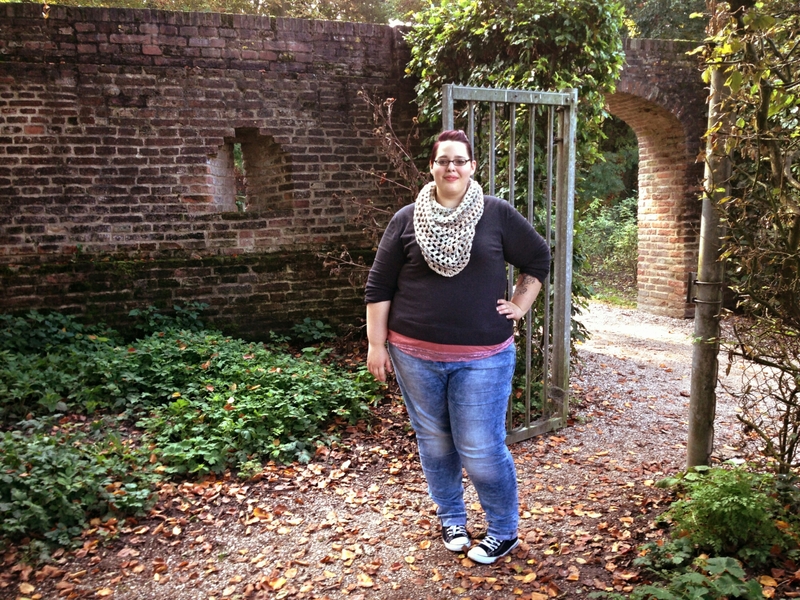 The pattern is “Lala’s Simple Shawl” and as always, can be found on Ravelry. 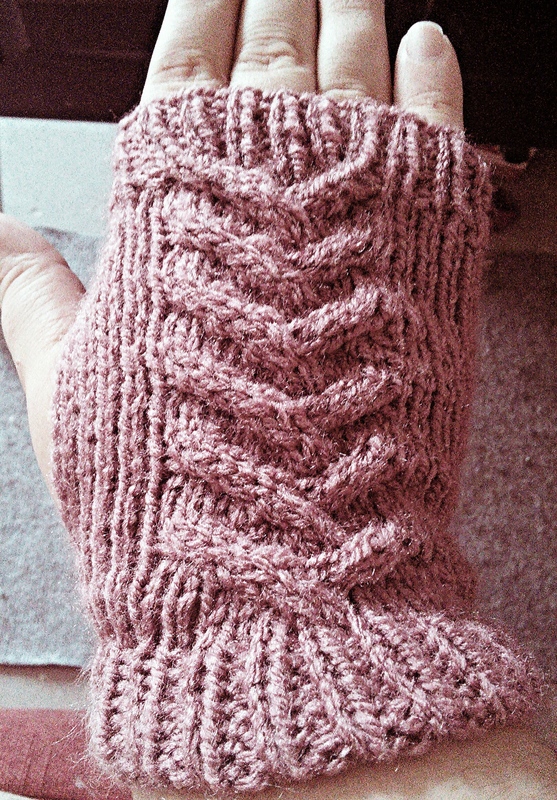 This is one finished fingerless mitt. 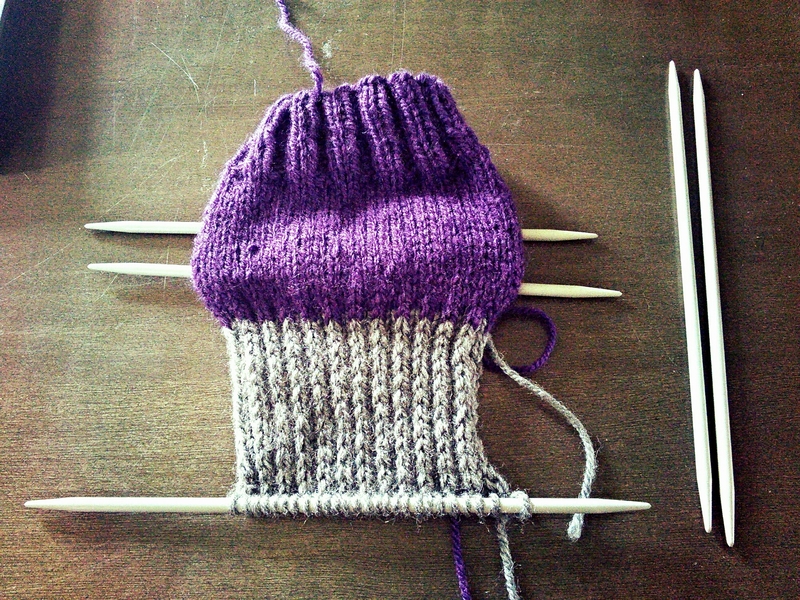 I’m having second mitt syndrome and the other is casted on but in my project bag. I plan to finish that up and free the needle this week. 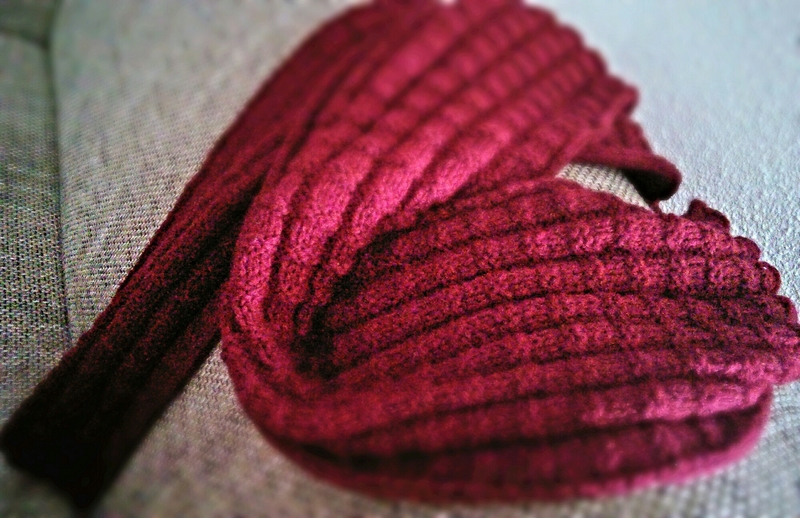 These will match my striped and slouchy hat I’ve finished. This pattern is “Across the Street and to the Bar Fingerless Mitts” (found on Ravelry) and it is a KAL (Knit-Along) for a group I’m in. Fun knit and very customizable! I love this hat. It reminds me of the Cheshire Cat from Alice in Wonderland. 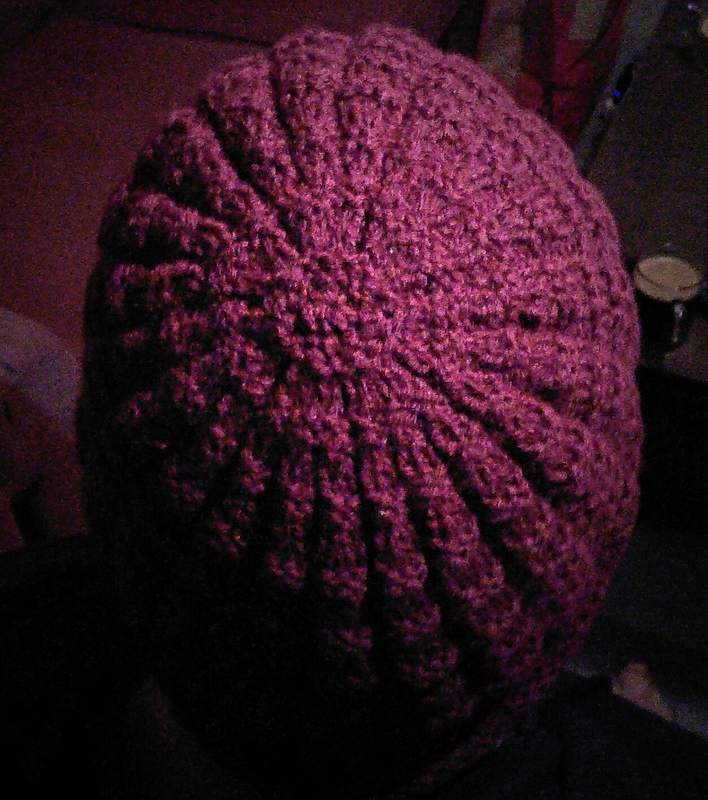 The pattern on Ravelry is “Striped and Slouchy Hat”. The baby blanket is in project time out again. Going down a needle size didn’t seem to help much. In fact, somehow it managed to make it worse with the way it was laying and ended up to be a million stitches to a row. Some things blocking just can’t fix. If I stick with it, it might be done once Alex retires. I have decided I don’t like the specific yarn and how it is laying and coming together in the big picture. So off to the yarn shop to find something else and the current yarn will be rewound and put back in the stash. Time only knows what it’s destiny is now. As I work on this baby blanket, the farther I get, the more I realize my needle size is a smidge too big and it’s making the stitches quite holey. When I started this project, I surmised that it might be an issue but I just kept going in hopes it would turn out alright. Shame on me… So now, the inevitable has to happen. Ripping back on hours of work because the project isn’t turning out how I would like it to. 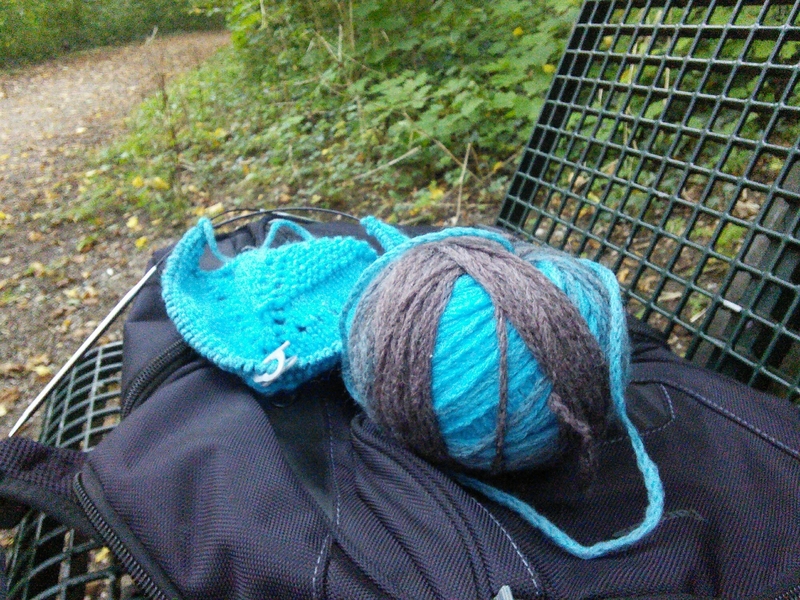 It’s been sitting in my project bag in some sort of knitting time out. I sulk at it from time to time but time’s a wasting and I have to do the painful frogging and just move on. Call it perfectionism or nitpicking, but when I make a project, I want to be proud of it. So out with the holey and it’s time to start again. On smaller needles this time! Onto more happy and positive things. 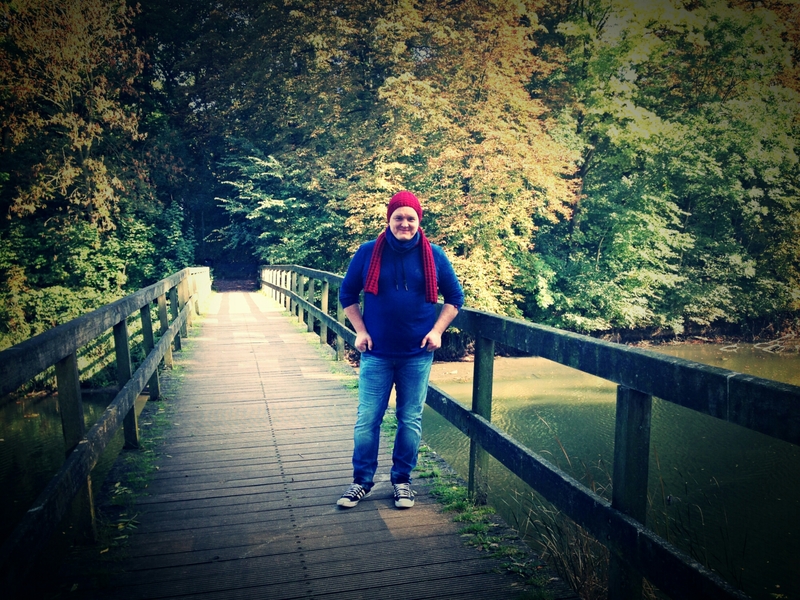 It was a beautiful day here in the Netherlands and Alex and I couldn’t resist taking a lovely autumn walk. 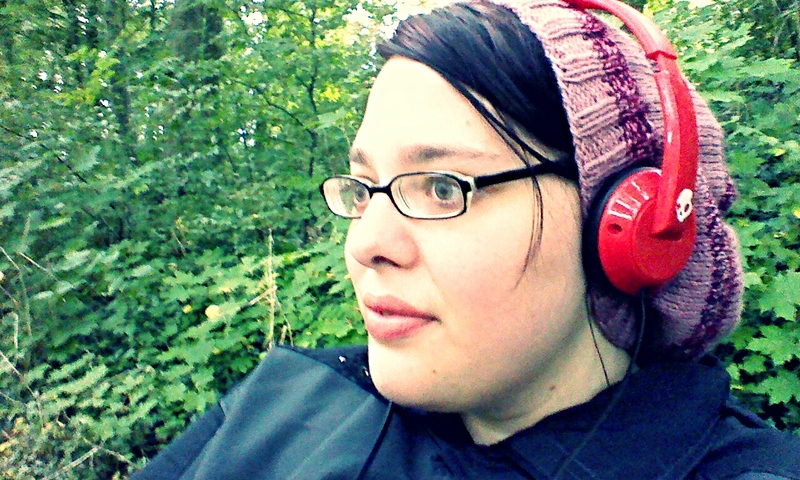 The leaves are starting to turn and the air is delightfully crisp. 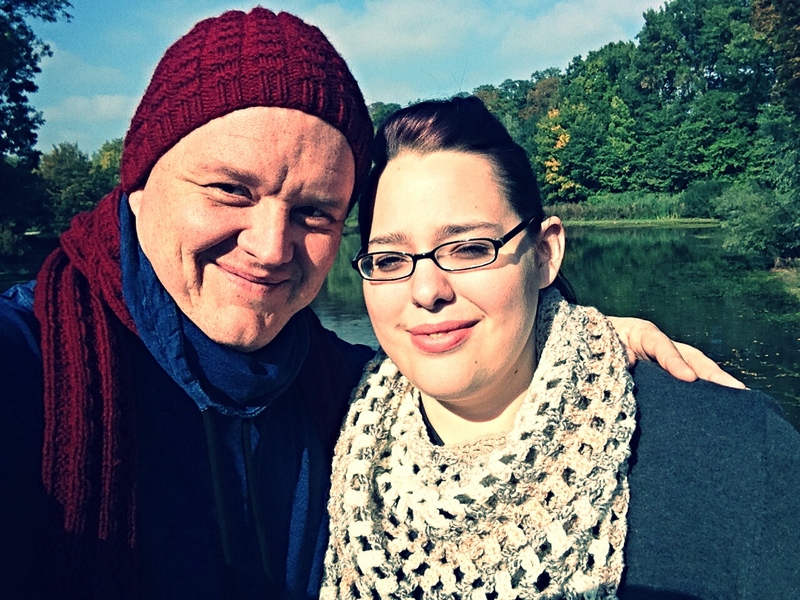 I finally got the chance to wear a shawlette I made months ago that was too hot for summer, while Alex proudly wore the hat and scarf I just knit him! 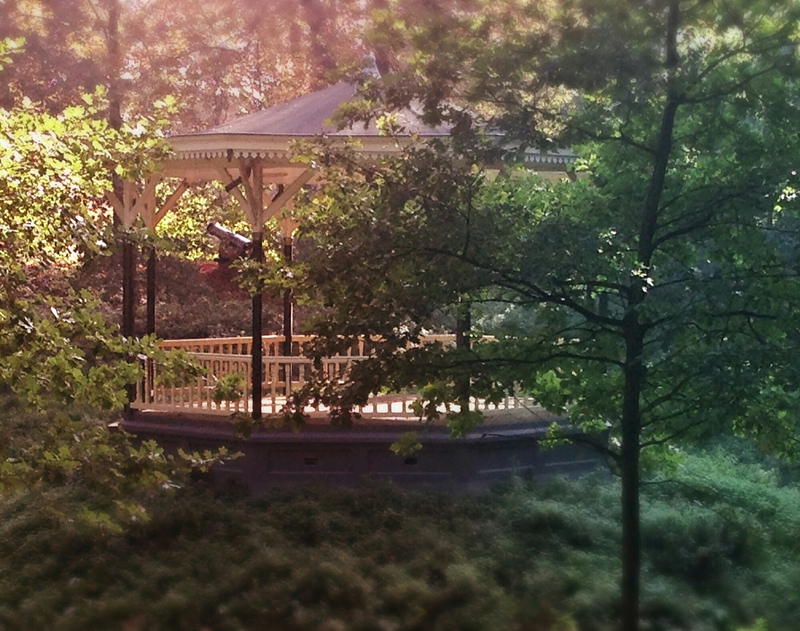 I especially loved this gazebo out in the middle of nowhere, and the only bloom left in the Heemtuin. 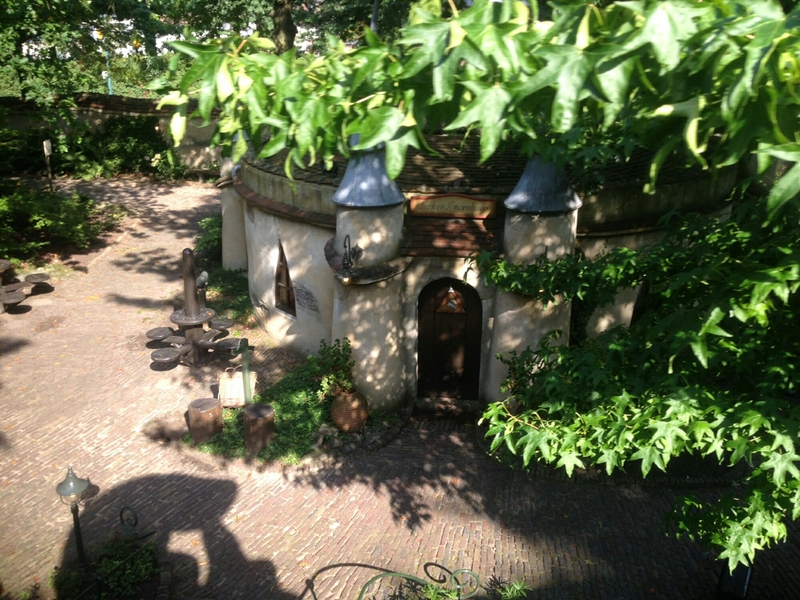 I can’t wait to take a walk in the Heemtuin during the spring and summer when all the plants come back. 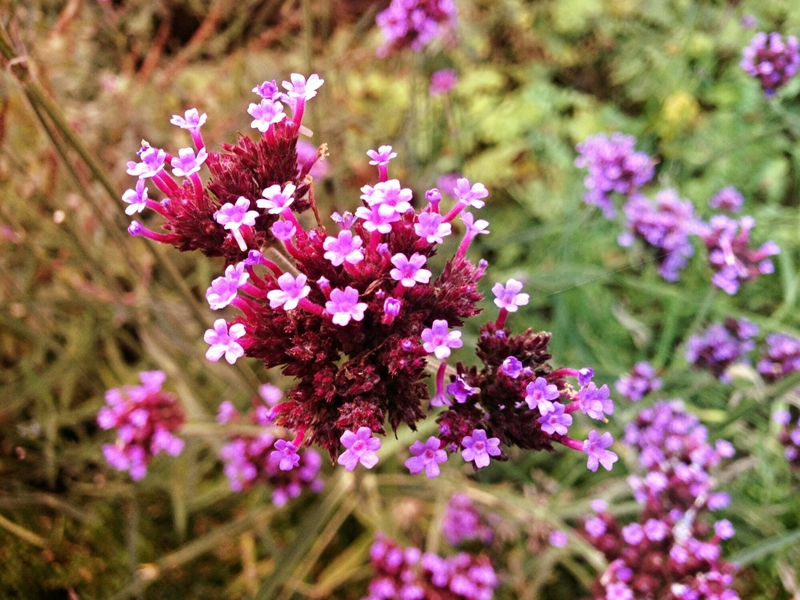 I bet it’s a beautiful sight to see with their butterfly, dragonfly and amphibian gardens. Alright, alright, enough from me for today. If I listen closely, that blanket is begging me to fix it… Until next time! Ever since I was a little girl, I have always been going from one thing to the next. Couldn’t hold my attention to a single thing for very long. For me, coming into the world of yarn crafts is proving to be no different. With me being bistitchual, it’s double the trouble. 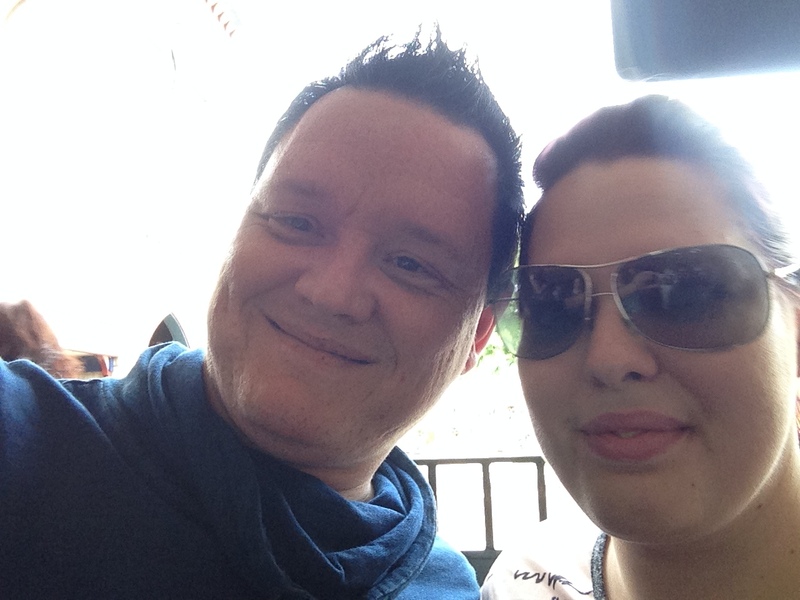 In the beginning, I was good about being project monogamous. Begin working on a project, finish that project before anything else. But the better I got at knitting and crocheting, I began to realize there is just not enough time to make all the things I want to make! I have such a hard time just picking a single project to work on. So to battle that, my needles are always full! So let’s look at my WIPs! Up first is the baby blanket. I haven’t made much progress on it but I have until Early December to get it finished. As you can see in the photo I’m just on the first few rows of cream. 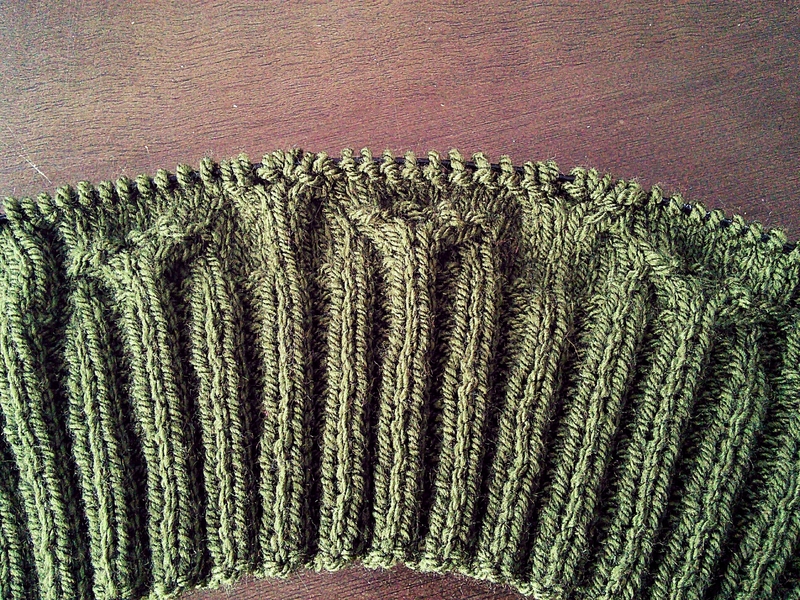 Second up on needles is another hat in its beginning few rows. You can never have enough hats and I love making them. The options are just endless! 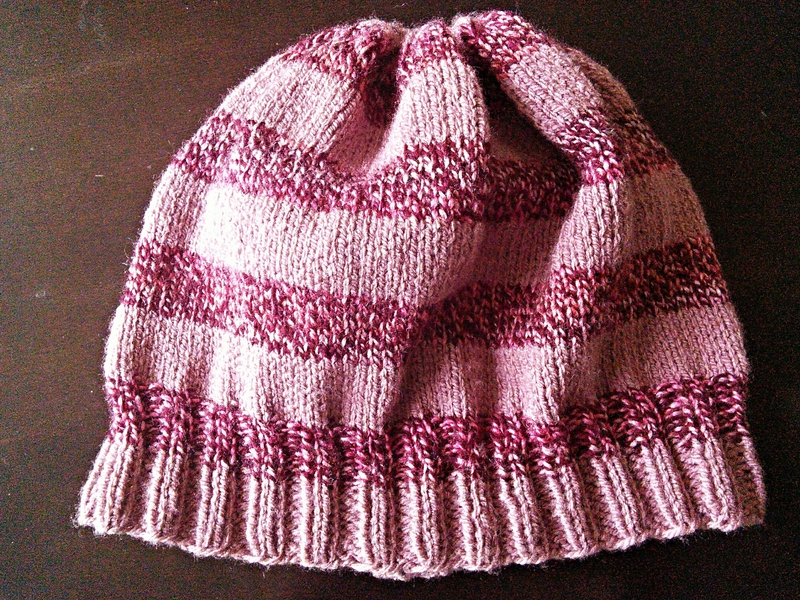 This particular hat is called “My Striped & Slouchy Hat” and can be found on Ravelry. I’m going to stripe it with some variegated yarn of the red flavor. Now onto the finished objects! I found this hat pattern on ravelry to match the scarf I recently made Alex. I couldn’t resist making it and it was such a quick knit! Soaked and blocked, here is the finished project! The pattern can be found on ravelry under “Christian’s Scarf” and “Christian’s Hat”. Alex and I have recently acquired Nintendo DS Lites again and are hooked on handheld gaming. 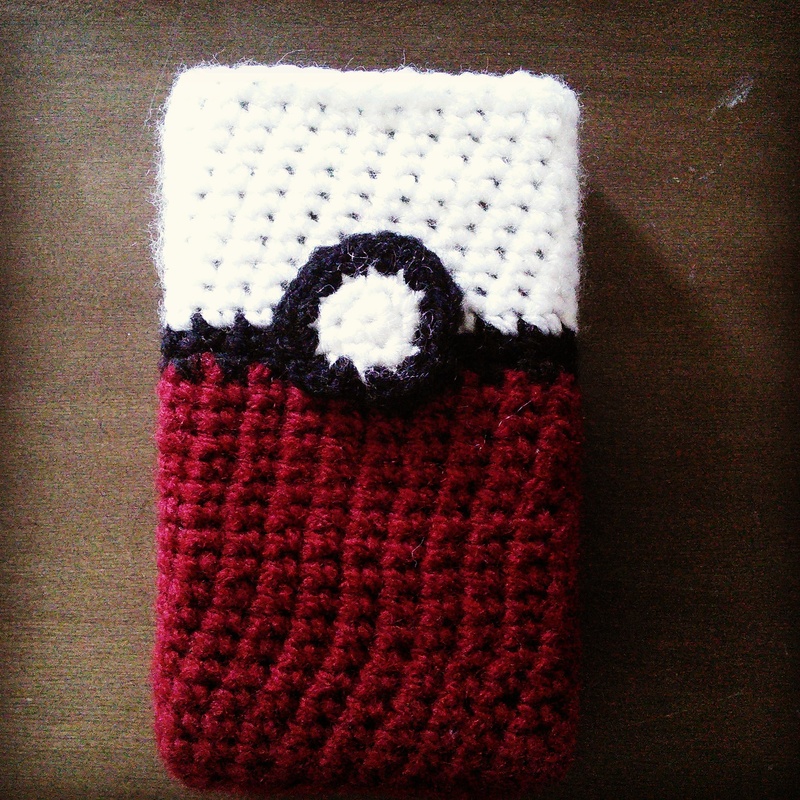 So I made a case for Alex Pokémon style! I haven’t decided what I want to make for mine but I’m sure I’ll come up with something soon. 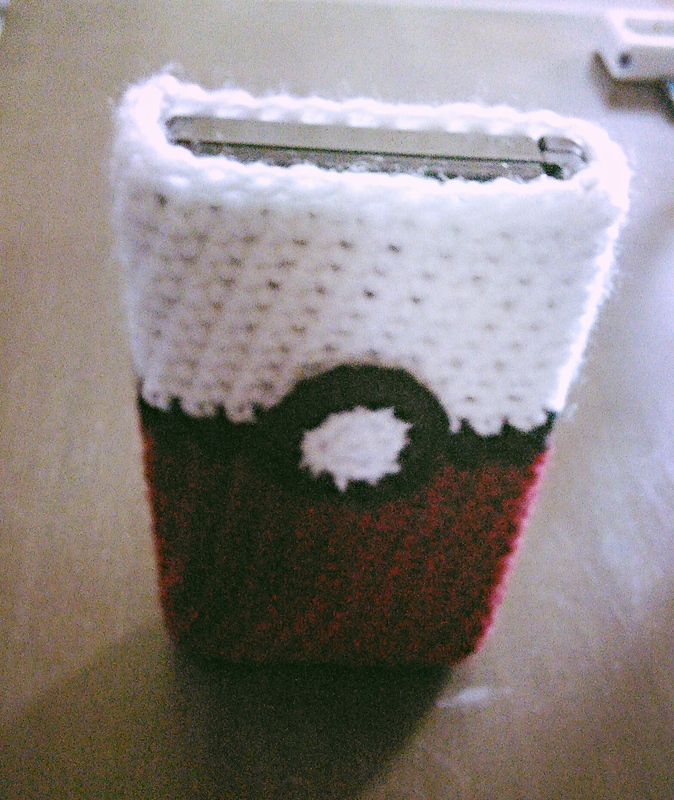 This is crocheted and since I just made it to fit there’s no pattern for this. That’s all I have going on for now! I’m sure in another week I’ll have started even more…and maybe finished a few too! 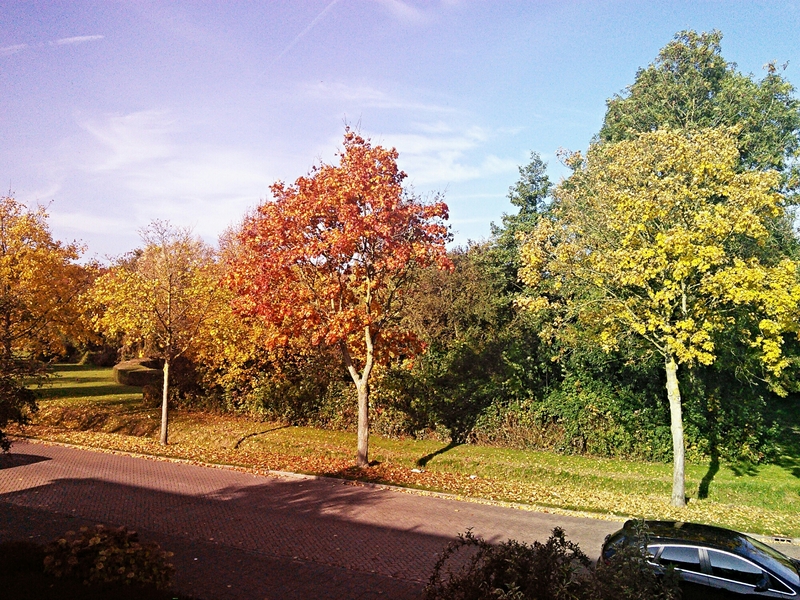 Summer is over and it is officially my favorite season, Autumn. Where the leaves will start turning and burst into beautiful rich colors. Where the days are cool enough to be cozy in scarves and gloves and hats. Where the morning air is crisp and full of potential to contemplate over a morning cup of coffee. Autumn, what a perfect time of year for weddings. Less than two weeks to our big day! 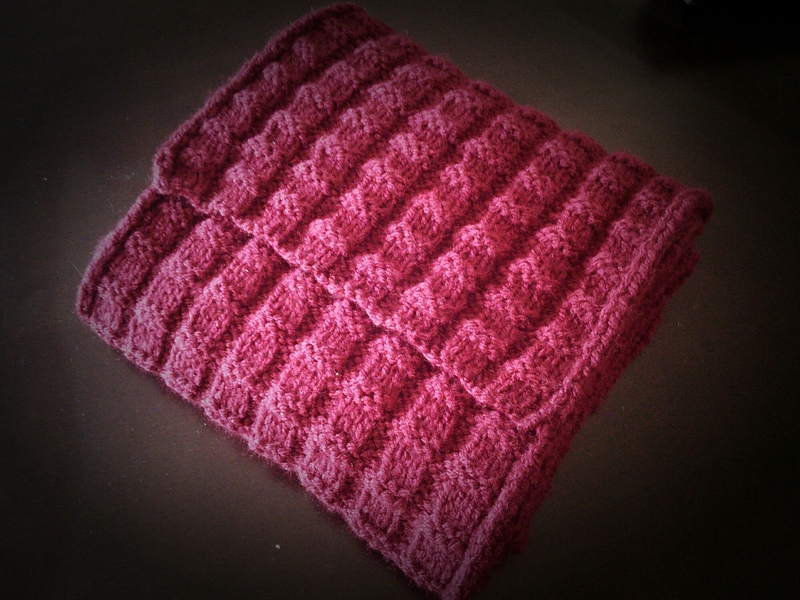 The scarf for Alex is finished and blocked! 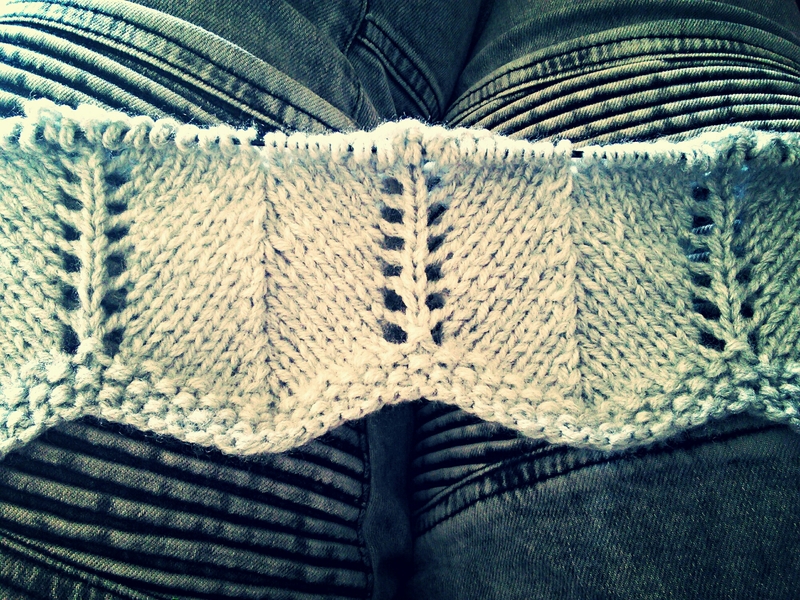 I must admit I got a bit impatient with the baby blanket and just had to start on it. So I went ahead and cast on and completed the first repeat of the chevron pattern. It has a seed stitch border and eyelets. It’s adorable and fun to work on. 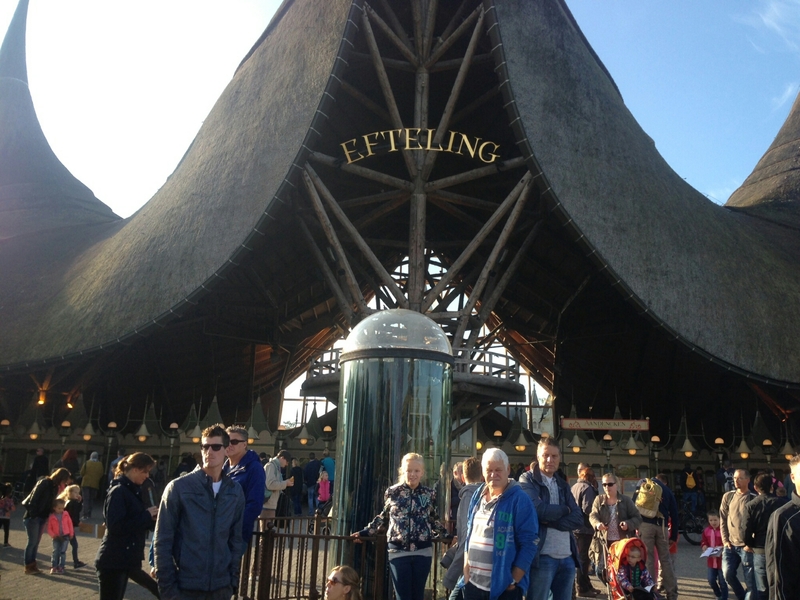 Alex and I went on an adventure to Efteling over the weekend with the family. I had never been there. 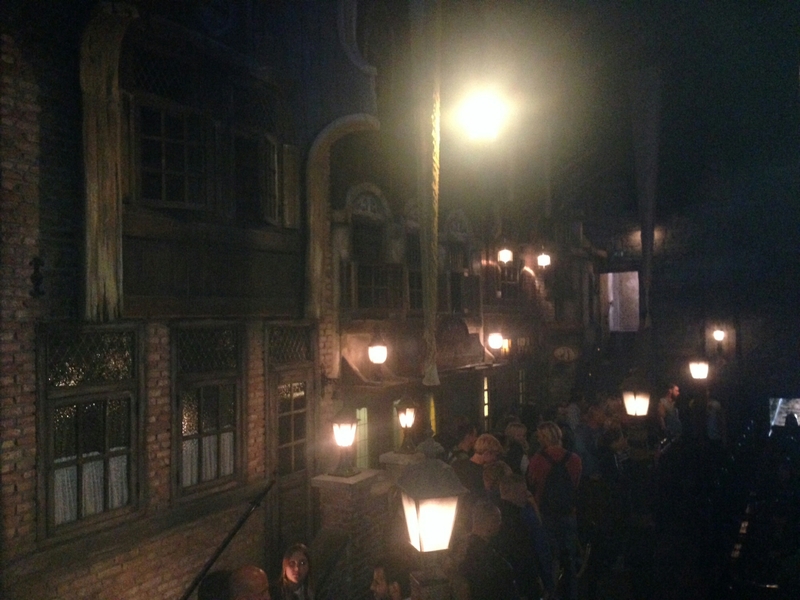 It was magical and strange, beautiful and kooky and I loved it. 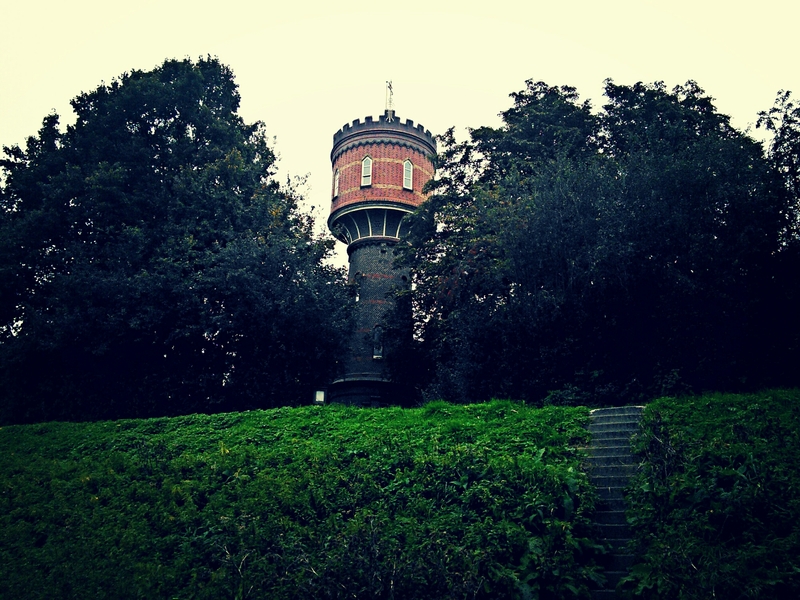 Everywhere you looked was something straight out of a fairy tale. It has given me quite a bit of inspiration for future projects I want to make. 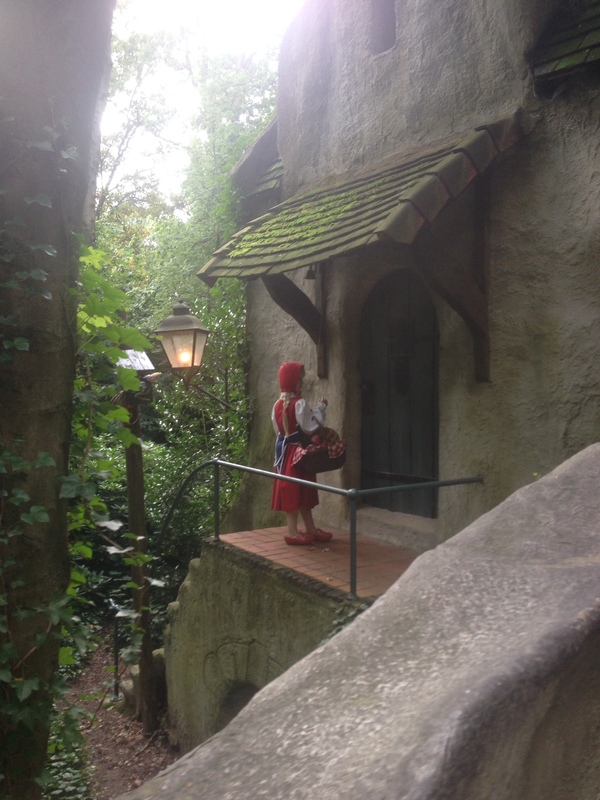 Truly a magical place where fantasies come to life! A fun weekend with new memories made. A perfect end to our summer. Until next time!